Chasing Amazing is looking at Mark’s favorite Amazing Spider-Man covers this week. Today, we look at choices #4 and #3. I have a secret I need to admit. I’m really not a fan of Steve Ditko’s artwork. I know, it’s blasphemy. In terms of his interiors, I thought he always tried to cram too much on a page. In terms of his covers, I always thought his Spider-Man looked scrawny and un-hero-like for lack of a better phrase. Send me all the hate mail you want. Without Ditko, there is no Spider-Man. I understand that. But you’re not going to make me like his artwork. 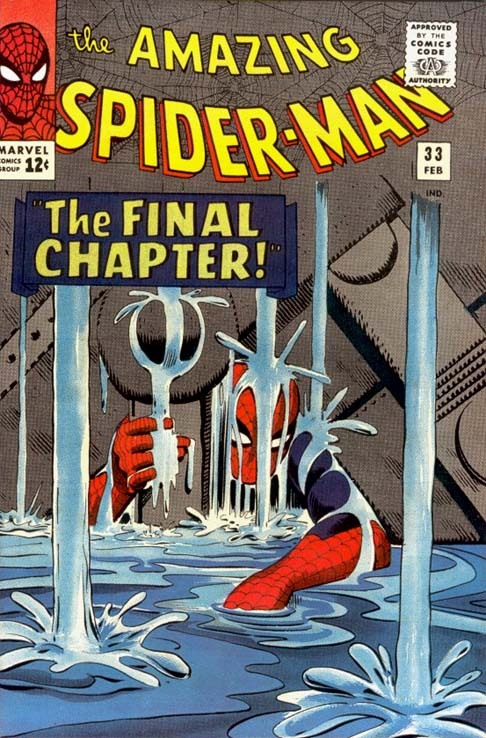 With all that said, ASM #33 is a brilliant cover, and obviously an iconic one that is revered by most comic book fans. Similar to the rationale I used for ASM #229’s cover, perhaps my impression of this cover is clouded by my adoration for the “If this be my destiny” storyline, clearly the high-point of the Stan Lee/Ditko collaboration through ASM’s first 38 issues. But I challenge you to find a more dramatic comic book cover during this era. There’s nothing particularly flashy about what we see here, but the image of Spider-Man, neck-high in water and buried underneath tons of steel is unnerving as it is memorable. The fact that the banner screams “The Final Chapter” is even more ominous. And it accomplished exactly what an amazing cover needs to do – it makes you want to instantly pick up the comic book and read what’s inside. I wish I could heap more praise on the artwork here, but see my first paragraph. This is the one and only Ditko submission on my list. Hopefully the comic book Gods won’t hold that against me considering the remaining eight issues I have on my list to get are all illustrated by Ditko! It’s funny, I love this cover so much yet I always have to double-check that it’s not another piece of artwork from my favorite Spider-Man artist, John Romita Sr. In fact, this is the work of Gil Kane, who probably warranted more love on this list, but can at least sleep better at night knowing that he was responsible for my third favorite ASM cover of all-time. You see a lot of recurring themes in my selections for this list: phrases such as definitive style, dramatic images and iconography. ASM #129 has all of these – the introduction of one of Marvel’s most famous anti-heroes, the Punisher, in a fashion that is memorable, dramatic, and of course, iconic. The perspective used on this cover is so incredibly unique that I can’t find all of the right words to praise it. The fact that for this issue of Amazing SPIDER-MAN, a new character is featured so prominently on the front was a daring idea. 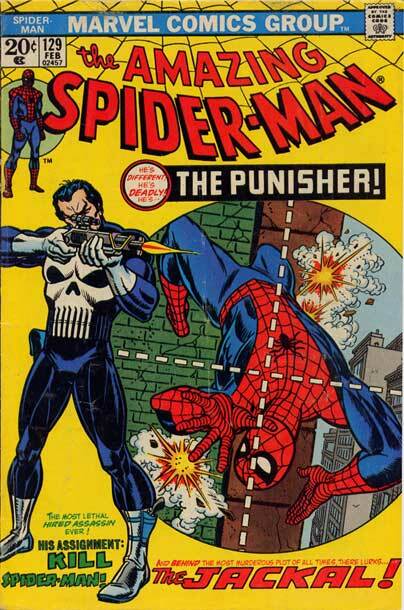 Not only do you see the Punisher on the cover, but the visual of Spider-Man is actually from the Punisher’s perspective – or the perspective of the scope on his rifle. So in effect, this cover is all Punisher. Not too bad for a character’s first appearance. I also can’t remember another instance in ASM history where multiple perspectives were used to this effect. For the most part, a comic book cover was a third-party look at one frame of action. The illustration may utilize a unique angle or off-beat coloring, but the perspective was always that of the reader. Kane’s ability to break the fourth-wall down only encourages me more to want to rip through this issue and find out how Spider-Man could possible survive a menace like the Punisher.